Spring can be very hot in the Sahara and that day of April was no exception. I was walking together with my guide through a proctected area in the middle of the Grand Erg Oriental, a huge stretch of sand and nothing at the border between Algeria and Tunisia. In the afternoon the heat was finally releasing its grip and a gentle breeze was making the atmosphere a bit more pleasant. Together with the coolness, the wind shaking the tamarisks seemed to carry ancient voices. In the solid silence of the desert then I fancied lost sounds of hunters and prey. Only a few thousands years ago in the same spot where we were, in fact, there must have been a rich savannah. A real one: with giraffes, lions, acacias and the whole shebang of animals and plants we all know from East Africa. Now, after seven millennia of climate changes, severe droughts and massive extinctions, one could not find here much else than sand, wind and silence though. I had arrived here following the tracks of something special, but also of a certain photograph. A photograph I had seen many years before. It was 1990 and I was 11, when the Italian leading nature magazine “Airone” published a very long article about the Saharan wildlife. The piece was illustrated with the ground-breaking work of the late French photographer Alain Dragesco, who had photographed many previously unseen or extremely rare desert species in over a decade of Saharan expeditions. Of the article I particularly remembered a double-spread with perhaps one of Dragesco's most remarkable shots: a male Addax antelope standing in a sandstorm. That picture was filled with ambiance and wildness; the massive white animal emerged with its long, twisted horns from the ochre tones of the background. It looked like a pale spectre, with the scars and wounds on its head, the clear marks of a life of struggle in one of Earth's most hostile environments. But that was not all. Next to the Addax picture, the photo editor had placed a smaller frame. The picture in it was showing a human body half covered in sand: an unlucky poacher who had probably died of thirst or starvation in the pursue of the World's rarest antelope. Another guarantee, it seemed to me, of the rarity of Dragesco's Addax picture. The strong combination of the two images and relative stories had stirred my child imagination like few other things had done before. The level of adventure, drama and otherness I felt spilling from those two pages would be hard to describe in words, and that visual experience left an indelible mark on me. I know that if I have chosen one day to become a wildlife photographer it has been mainly because I was dreaming of exploring the Planet to make similar encounters in the wild, and, once back home, be able to make other people feel the same magic as well. Almost three decades have passed since that picture was published, but it kept haunting me for all this time. Probably very few remember today (or will ever know) the name of Alain Dragesco and his great work, and this probably also because he sadly passed away in 2002. The Addax, on the other hand, remains a species on the verge of extinction. I have always loved the challenge represented by the photography of rare and elusive subject living in difficult places. I prefer to have things simply happen in front of my camera, rather than seize opportunities to realize preconceived images. And this, beside the personal entertainment, for I believe in the power of serendipitous pictures to inspire people. The idea that a single strong picture could affect so much a person's life, like that very one had done with me, has been often enough of a drive for me to keep trying. Indeed, I have often thought one could make a difference with photography. Therefore, having in mind Dragesco's example, I wanted to humbly follow in his footsteps and try to continue his unfinished work with the endangered but often ignored Saharan wildlife. I wanted to start where he had left and see with my own eyes what was the ongoing situation with antelopes, gazelles and so on. The desert of Niger was the highest ranking in my bucket list, not least because it hosts the last wild population of Addax antelopes in the World. But, after having missed a great opportunity to join a scientific expedition a few years ago and having failed since to raise the required budget to travel in the area, the political situation in the country had worsened so much that reluctantly I had to change my plans. Meanwhile most of the other countries in the heart of the Sahara have become very unsafe or difficult to reach as well. To work in this region requires very expensive and extensive logistics, hard-to-get permits and political support. By now they are all virtually out of reach for most of the self-assigned naturalists and photographers who wish to get there. 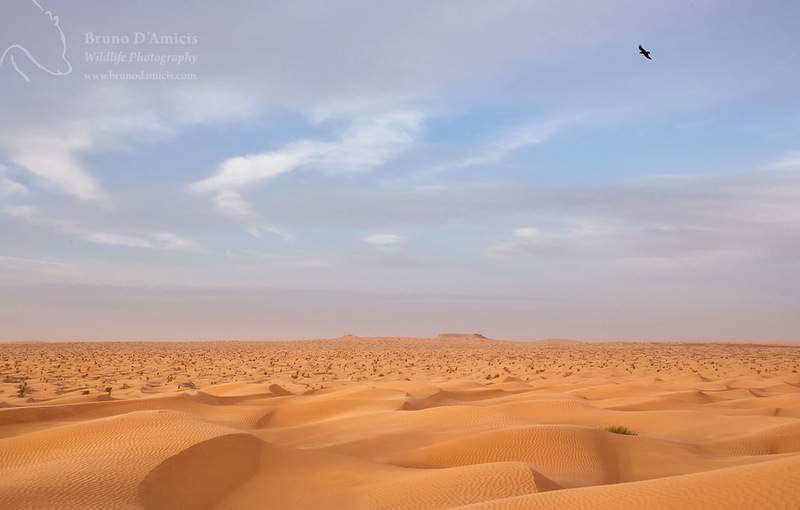 This is why, for my desert photography, I had started focusing my attention to the somehow safer Maghreb. From the mountains of Morocco to the sands of Tunisia, I have spent part of the last nine years exploring and photographing the northern end of the Sahara. I have discovered amazing places and challenging subjects, and I have fullfilled part of my longing to work in the desert. But I never forgot that picture nor my initial dream. 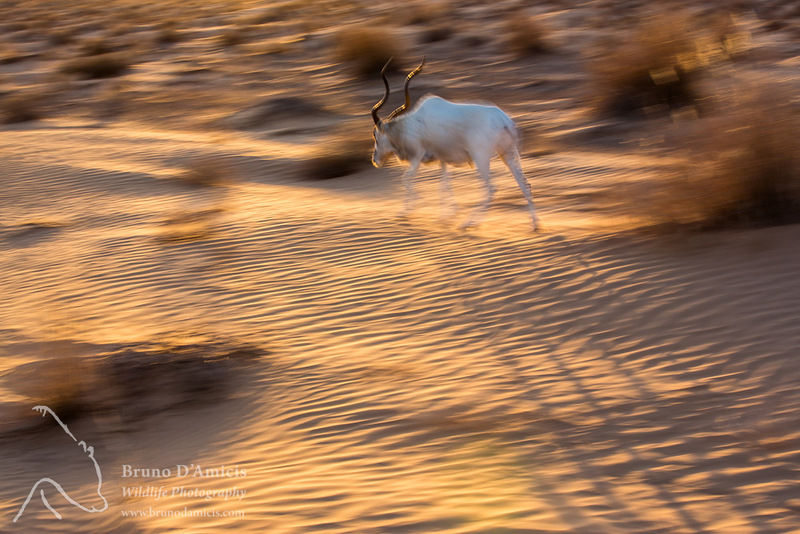 I knew that eventually I would have been able to follow one day the tracks of the Addax in the sands of the Sahara.